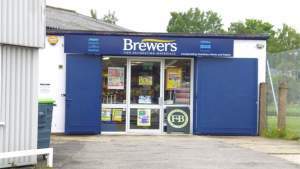 Our Grantham Decorator Centre was formerly known as Grantham Paints and Papers, and became part of the Brewers family back in 2008. We carry a good range of trade and designer paints, a large wallpaper pattern book choice, and have in-store terminals so you can access Wallpaper Direct and Designer Paint and browse the full range. As well as offering you plenty of product and decorating expertise, our team will always give you a warm welcome. Perhaps even more so if you bring your dogs – it’s a pet-friendly store. You’ll find us off the A607 Harlaxton Road soon after the railway line; just turn in beside ARC Car Wash, opposite the Esso petrol garage. There’s lots of customer parking out front. Head east on Harlaxton Rd/A607 towards Belvoir Ave. The store will be on the left. Head south-west on Harlaxton Rd/A607. The store will be on the left.